Another bit of 90s dance dedicated to my jogging pals, this time from D:Ream, which though other people flitted around the sidelines, was essentially the nom-de-disque of one Peter Cunnah. Despite poppy numbers like “Shoot Me With Your Love” and the number one smash “Things Can Only Get Better”, he was just about able to cling onto some shred of club credibility thanks to some harder-edged remixes, such as those provided here by Leftfield (yes, them again). 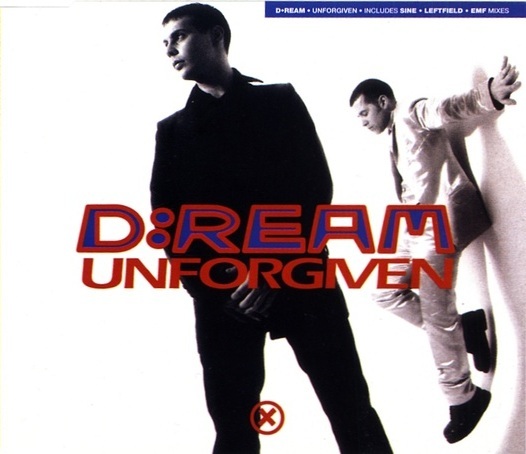 D:ream’s debut album D:Ream On, Vol. 1 (clever wording, cheers) had a ridiculous number of singles lifted from it, partly because at the end of its initial singles campaign, a last-ditch reissue of “Things Can Only Get Better” became a massive hit, leading to the album being reissued in a new cover, and the launch of what was effectively a whole new promotional cycle. “Unforgiven” was one of the singles from the original campaign, achieving a readily-neglected no.29 chart placing.